Binjai Residency is a low density developments of only 100 units. 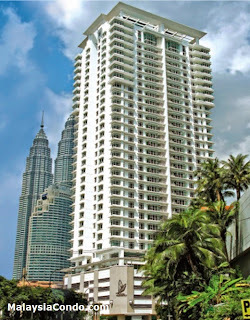 Located along Lorong Binjai, behind Menara Citibank and Nikko Hotel. It's only minutes walk to the Petronas twin Tower. Level 6 to Level 23 of Binjai Residency allocates the Type A, A2 and B2 of executive units consisting of 3+1+2 bedrooms with 5 bathrooms. Slightly differ in layouts, Type C1, C2 and D2 of premium units at Level 23A to Level 29 have the same number of bedrooms and bathrooms as the executive units. The penthouse units, on the other hand, are duplex units with much more spacious areas. Built-up Area : 2,096 sq.ft. - 6,557 sq.ft.